Company History & Corporate Experience - Procurement Solutions, Inc.
Procurement Solutions Inc. (PSI) is a Veteran Owned Small Business formed in March of 1997 to assist companies in reaching the Federal Government marketplace with their products and services. While we specialize in small to medium size businesses, many of our clients are now large companies in the Federal and commercial markets requiring schedules with over 20,000 line items. We have a very high success rate in attaining GSA schedules for our clients and have helped to maintain and modify these contracts for them as their business services change and new product lines are established and expanded. Many of our clients are repeat customers for additional schedules, modifications, training and other services. Procurement Solutions, Inc. will use its experience to be your company's "GSA Portal" to Federal Government business. Our consultants have successfully prepared and negotiated many types of GSA Schedule Contracts. PSI advises clients, evaluates pricing, conducts client training programs, advises both VARs and Manufacturers, provides delivery order consultation & marketing services and negotiates schedule modifications. PSI has consulted clients on other non GSA special projects and proposals including management issues, proposal preparation, proposal pricing, red team reviews, oral presentations and conducted FMS case price out analyses for multi-billion dollar foreign military equipment procurement programs. PSI offers the following services to assist in the management of your GSA Schedules: GSA Schedule Consulting, Training, Post Award Services, Contract Compliance Services, GSA Contract Audit Assistance, General Consulting, Procurement Consulting, Proposal Consulting, and Marketing Services. Procurement Solutions, Inc. is located convenient to the Baltimore-Washington DC corridor and is in close proximity to the General Services Administration Washington DC offices. 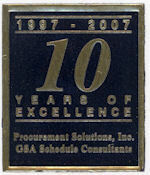 Our focus at PSI is to get our clients on the GSA Schedule. We believe in order to do that properly we should be involved in every phase of the GSA Schedule process. PSI has experience in assisting our clients in gathering information, writing supporting documentation, properly preparing proposals, reviewing pricing, negotiating contracts and publishing award documents.